This summer, work began on repaving roads and replacing sidewalks in the Financial District. 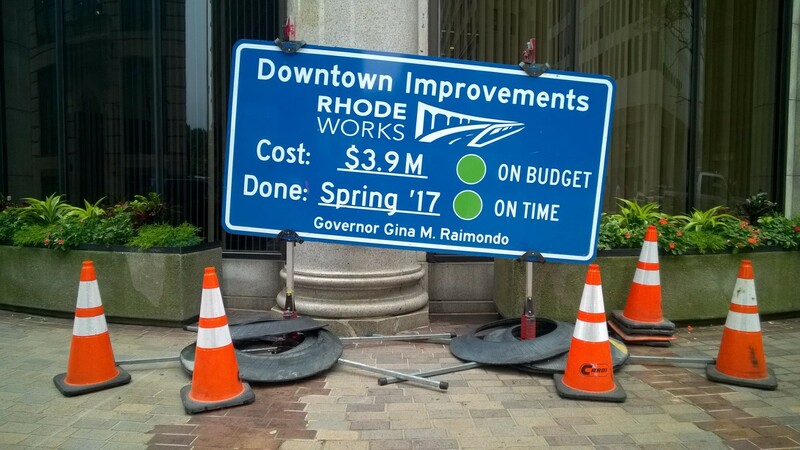 Rhode Island Department of Transportation (RIDOT) is managing this project in order to improve accessibility downtown and comply with new standards of the Americans with Disabilities Act (ADA). 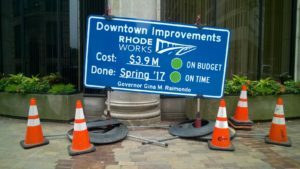 The roadway will be resurfaced on Westminster Street (between Dorrance and Exchange streets) and on Weybosset Street (between Dorrance and Westminster streets). Sidewalks will be replaced with concrete on Dorrance and Exchange streets (between Fulton and Westminster) and on portions of Weybosset Street (between Dorrance and Westminster). Parts of Westminster Street (between Dorrance and Exchange) will be replaced with exposed aggregate sidewalks. Outside the Financial District, sidewalk corners will be replaced near Trinity Rep on the north side of Washington Street (between Empire and Adrian Hall Way). The work also includes installation of new curbs, bike hitches, bollards, and decorative lighting. Completion is expected in 2017.